Everyone needs a little sweet treat now and again. It doesn’t hurt that this sweet comes in the form of a frozen Mojito Cocktail. Take a look and you will see that strawberry floats don’t have to be reserved for the kids. This recipe is good is enough for all those who are young at heart. 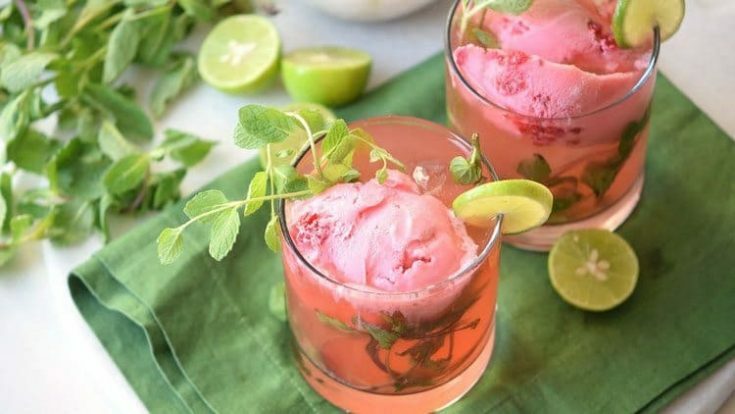 For that matter, it’s great for anyone who might enjoy the combination of Strawberry and Mojito that this drink encompasses. Us? Well, we think this drink is pretty darned good. We love have a cocktail with a scoop of frozen goodness. Looking for other new and nummy cocktails to sip on? You simply have to take a look at our Lemon Drop Cocktail and our Watermelon Margarita. If you’re feeling rather brave…you might even want to try our Hibiscus Lime Spritzer. Mojitos are easy to make but it does help to have a couple of essential mojito supplies on hand. The first and foremost essential is a cocktail muller, which is used to mash up the herbs in a mojito. In a pinch, you can use any old glass. If you want to serve your Mojito Cocktails up in style, you might want to rethink that. In fact, if you enjoy a mojito on a regular basis–you might want to invest in a set of mojito glasses. And seriously, with so many varieties of mojitos out there, we get plenty of use out of our mojito glasses. Like with this Blackberry Mojito. In a pitcher, mix the mint, lime juice, rum, and strawberries. Fill with the soda water and stir. Add two scoops of ice cream into each glass. Garnish with lime wedges and mint sprigs. Substitute rum for more soda water for a non-alcoholic version.